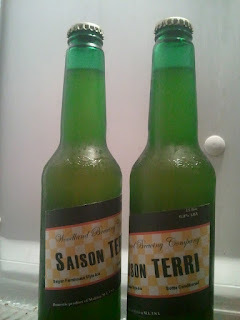 The first of the Saison Terri just went into the fridge! As of today it has been bottle conditioning for two weeks. Because of the high end of summer temperatures and the low flocculation of the yeast my hope is that this will have enough CO2 produced at this point to carbonate the beer. It will sit in the fridge for one week to allow more of the carbon dioxide to go into solution. This one came out very good! We will be doing this recipe again! The high fermentation temperatures coupled with the WLP566 Saison yeast created some wonderful flavors.